2. Make eye contact and say hello. Every time you pass somebody, you smile and say hello. Wouldn't it be nice if we did that more often (other than people thinking we were a little strange - LOL)? 3. Eat slowly. Meals in the dining room are served in courses and you wait while other tables are served. It helps you eat slower and not eat as much! And you feel free to sit and enjoy the conversation at your table. We might not be able to do that for every meal in our homes, but maybe we can make it a priority for one meal a day. 4. Dress nicely and modestly. You're not allowed to wear sweats/lounge wear/tank tops to the meals in the dining room and you can't wander the halls in PJ's or robes. It does make everything feel a little more special when everybody has put some effort and thought into their clothing. I know I've become lazy with clothing and could use a reminder that lounge wear really should just be for curling up on the couch in the evening or for a sick day. 5. Be considerate of others. It's simple - think of others first. Be considerate when driving, when talking, when shopping, when eating, etc. Remember J.O.Y. (Jesus first, Others next, Yourself last)? That's always a good reminder. I get stuck in "me" mode sometimes. 6. Stay active. The retirement home offers lots of activities - walking, exercise classes, pool table, card playing, Wii golf and bowling, armchair volleyball (Dad likes that one), horse shoes, movies, barbecues, and more. Don't just sit - do something! I've been feeling much better since I've started working out 5-6 times a week since I don't have much else in the way of activity. 7. Meet new people. You're always meeting somebody new in the hallway or during an activity. You can sit at different tables in the dining room and meet new people there too. It's good to put yourself out there and make some new acquaintances. It helps you (me) brush up on those rusty social skills and maybe make some new friends! 8. Have a little fun every day! There's something to enjoy every day - whether it's chatting with others, gardening, working on hobbies, reading a good book, or laughing with friends. Take some time to "play" each day! 10. Don't run on the stairs. :) There are signs on one indoor flight of stairs emphasizing NO RUNNING on the stairs and to be quiet while in the stairwell. We did giggle a bit at the idea of older folks running and shouting on the stairs - LOL. But then my dad actually did run loudly down the stairs to embarrass us and said he would point his finger at my son if anybody said anything. Well about the 3rd time he did that, somebody looked out at us from the apartment next to the stairs! Dad went over, apologized, tried to explain that he was doing it to scare us, and said it wouldn't happen again. LOLOL!!! 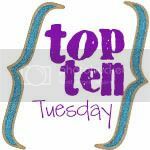 It's a list of 10, so you know I'm linking it up to Top Ten Tuesday at Oh Amanda! Check out all the other Top Ten's there! Do you have any more lessons to add? Let's hear 'em! I love it! Thanks for this list. In today's busy life, we all fail at all those. I especially like #2. to simply smile and make eye contact. Huge! Awesome list. I've often wondered why, for the most part, we only let college students and retirees live in supportive communities. I think it's how we're meant to live. We like to think OUR generation has life sussed but we can learn lots from previous generations too! There are definitely times that we need to slow it down but I'm usually to busy to notice. Actually I do slow down each day and just sit and talk with my kids and have coffee or tea. I just like to chat with them. Then hubby comes home and we will chat and stuff. Big maybe someday we can all be in the same nursing home so your son can come by and I can whip him at Wii bowling size hugs to you! Oh you don't think I'll be competitive when I'm 80? LOL! This is so true. We have a ministry through our church were we go to an assisted living center once a month to do a hymn sing and devotional and those things work there too! That sounds like a nice facility that your dad is in. I am glad you got to stay there with him!